Armor plates as ceramic plates III (3) and IV (4) used against rifles rounds, in IDF they mostly used against assault rifles and sniper rifles. Body armor in IDF mostly used without armor plates with IIIA rated bulletproof vest. Same for Israeli police and security forces in places around the borders. These armor plates stop hight calibre bullets before their hit can be fatal. A known form of protection with body armor is with ceramic plates at level 3 and level 4. 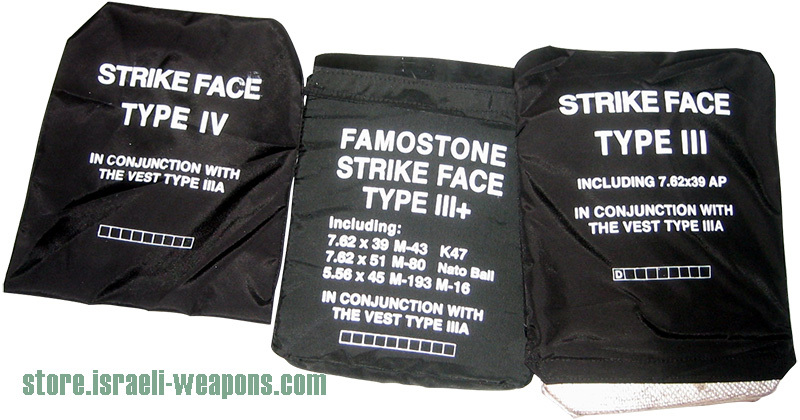 Simple bulletproof vests rated I/IIA/II and the highest rating is IIIA (3A). Unless the armor plates are stand alone, they need to be used with IIIA type bulletproof vest. These level III and level IV hard armor plates known to protect against hand guns as well as rifles. What Level III Body Armor Protects You From? There are several things you need to know about level III armor plates. bullet proof vest IIIA allows you to remain protected against flat head bullets at specific speeds and distances. The level 3 amror plates can be used in conjunction with this particular vest. They designed to protect you from rifle bullets that may be used. Many will place this as a strike plate in the front of a bullet proof vest, specifically to create more protection from potential harm that it creates. When combining the Level III / IV armor plates and Level 3A vest, you will be protected against rifle fire (check NIJ table for more info). The Level IV body armor usually made from ceramic plates. Level 4 armor plates are more resistance against the higher speed and velocity that is used with rifles bullets. A bulletproof vest will keep you secure from different types of bullets while ensuring that you receive little to no impact from being hit by most pistol/handgun fire. The Level 3 and level 4 armor plates also allows you to remain protected against rifle fire.